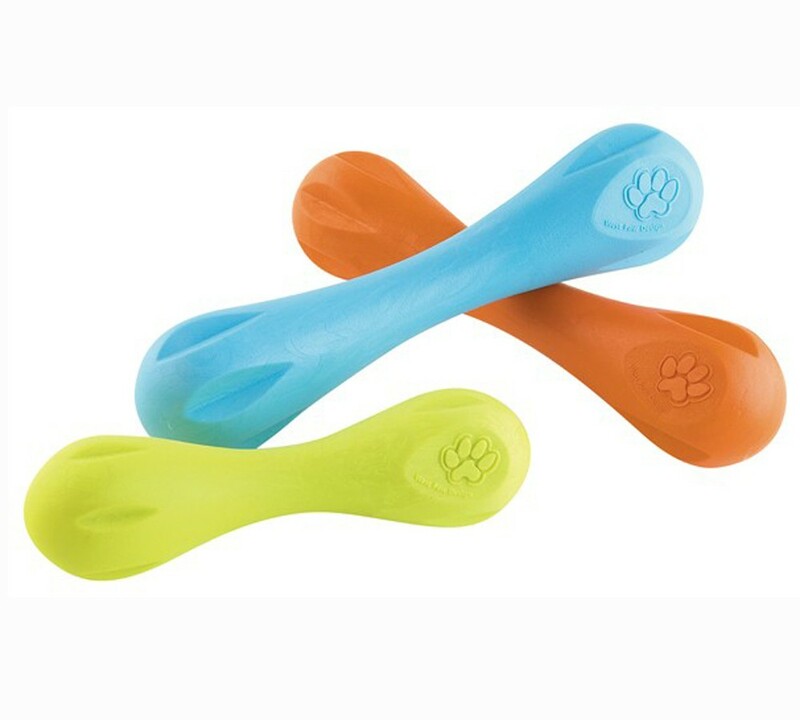 West Paw makes the world's safest dog toys, Zogoflex® toys are completely non-toxic material, are BPA and Phthalate-free, Latex-free and FDA compliant (meaning they're safe to eat off of). The Zogoflex material is from the United States and manufactured in Bozeman, Montana. Made from Thermoplastic Elastomer (TPE), Zogoflex's material is extremely durable, elastic and can continue to be recycled without compromising the products integrity. Zogoflex Does NOT contain: Lead, Cadmium, mercury or hexavalent chromium, latex, natural rubber, phthalates, hormones, asbestos, polychlorinated biphenyls, polybrominated diphenyleterh/biphenyls, radioactive compounds, Azo Dyes, NPP (Trisnonylphenylphosphite 26523-78-4), Class I or Class II Ozone depleting substances, genetically modified sources, Bisphenol A.
Zogoflex floats—making a splash for water-happy hounds. For dogs who love to swim (or just need a distraction in the bathtub), Zogoflex® stays afloat. Easy clean-up: Zogoflex goes right into the dishwasher. It’s easy to sanitize Zogoflex® at home—just pop it on the top shelf of your dishwasher. Zogoflex is our exclusive bendy, stretchy, bouncy material. Zogoflex® is our exclusive material that makes fetch, tug-o-war, and chew therapy more fun—it’s easy on doggie mouths, stretches (without stretching out) and sports an unstoppable bounce—all while staying tenaciously tough. Dog toys made from Zogoflex® material are the best of everything. Really! These toys are durable. They aren't rigid, so they are gentle on teeth. They float. They are eco-friendly. Most important, they are FUN!